Lake Okeechobee is one of the best lakes to adventure out on. All year long you can enjoy the wonderful wildlife and exceptional bass fishing. 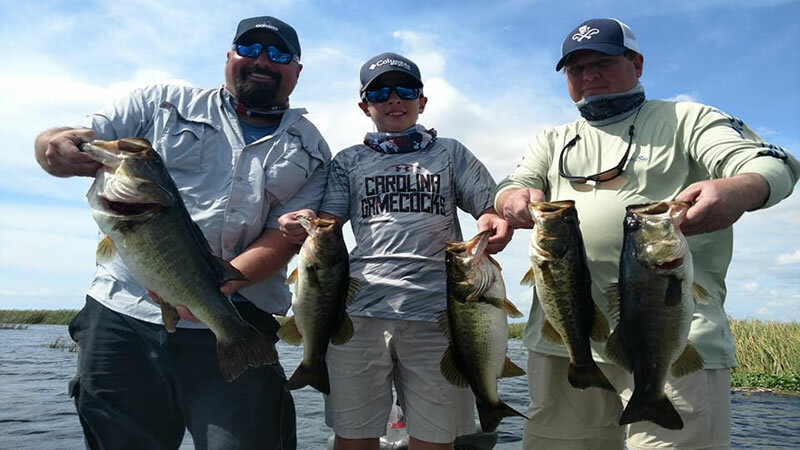 October Okeechobee City Fishing has been fantastic with some great numbers and big bass. You will not be disappointed if you choose to take a fishing charter this month. The fish are biting! Our local experts have extensive knowledge of Lake Okeechobee. Captain Brian Brown may specialize in Okeechobee City but he can show you an experience at all of our destinations here on the lake. Whether you wanted to explore Lake Okeechobee with live bait or artificial baits, he is the man to get it done. Captain Brian had the pleasure of fishing with JW and his son Tanner along with his brother-in-law Wally. They were traveling from South Carolina to escape some of the life events that they were going through. Hurricane Florence caused some damage and flooding to their homes and they were looking to get away and go bass fishing. 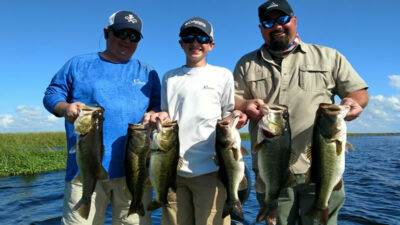 Lake Okeechobee was a great option and they had a fantastic two days of fishing on the lake. Great weather and fishing conditions promoted some excellent fishing. Throughout the trips, the winds blew light and then heavy. It did not stop the bass from biting strong on both trips. These gentlemen really knew how to put some bass in the boat. Left and right they were catching them up. Each local hole we went to they found fish. The first day on the water was a blast. There were lots of boats on the water as many tournaments were going on. We still managed to find some quality spots to catch fish. JW, Tanner and Wally caught lots of fish with the best in the 4 pound range. Originally this was going to be an 8 hour fishing trip but turned to 4 hours as they ran through all the live bait catching fish. Day 2 was another fabulous day on Lake Okeechobee. This time they adventured out with more bait to spend more time on the water. There was not much luck in that as the fish were biting in our spots. The wind was blowing more on this trip than the last but that did not stop the feeding. Before long, they were out of bait after crushing even more quality largemouth bass. The biggest bass of the trip came on this day weighing in at 5.75 pounds. Wally was extremely excited to put a fish of that caliber on the boat. Everyone really enjoyed being out on Lake Okeechobee. Lots of laughs and new memories were made. Next time they are traveling to Florida, this will be the first thing they embark out on. Captain Brian is looking forward to the next opportunity to fish with these gentlemen again in the future. He hopes that everything goes back to normal at home! Lake Okeechobee is looking fantastic and beautiful this time of year. 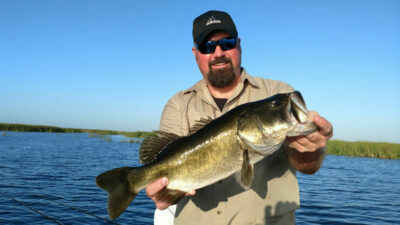 All the reports and news about Lake Okeechobee are incorrect and the fishing is going to be amazing this season. Our team has concurred that all our locations are fishing great and are healthy. We are already starting to see some nice fish caught. Don’t miss out on your adventure to fish this alive and well fishery. We look forward to seeing you on the water next time.